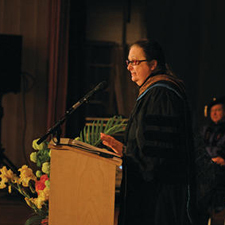 Susan Szenasy, Editor-in-Chief of Metropolis magazine, delivers the 2008 Commencement Address. 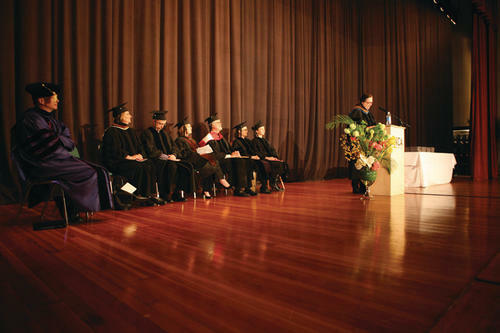 On the afternoon of May 25th, after receiving a Doctor of Art Honoris Causa from the Pacific Northwest College of Art in Portland, Oregon, I gave the commencement address following a series of speakers who talked about the need for, and the practice of, connectivity. Here is what I said to the 61 art grads, their friends and relations, teachers and the community gathered in the Tiffany Center’s cavernous hall. Just about now you may be thinking of grabbing your iPhone or Blackberry or some other digital tool you own and sending off a quick message to a friend seated behind you, or to your mom or dad somewhere in this room, or to someone who could not be here to share this important day with you. I think it’s great that you care so much to be in touch with so many, so often—sharing all the minutia that adds up to the sum of your life. Your phenomenal ability to be in touch, to connect, is something I’d like to talk to you about today. This unprecedented connectivity is now helping us write the story of the 21st century. And I would like to remind you that every age writes its own, unique story. Call it a myth, a fable, or culture—this story is of a central belief, a widespread understanding which helps humanity organize its thoughts and focus on its destiny. For instance, the early 20th century story was about the machine and what it could produce for the benefit of humanity. America’s late 20th century story was about hyper-consumerism and the happiness that would come with material accumulation. Today and in the near future, all of us together are writing the story, the organizing thought of the 21st century. Surely our web of connections, with their world-wide reach, and our ability to share personal information, supported by instantly-available data, will be a major part of our own story. But this connectivity is too important to leave in the bits and bytes world of electronics. This new, hyper-connectivity must enter our physical world, the world of all our senses. So let’s experience what this physical connectivity might feel like. Let us, all of us in this room, inhale now, exhale, inhale again. What just happened? We did more than clear our sinuses. The moment we experienced together has a much larger, more profound meaning. We just shared a breath together. No, this is not a gross thing. It’s a beautiful, poetic sign of our inescapable connectivity. What is more fundamental to our newfound connectivity than the air we breathe? Indeed the story of the 21st century has to center on protecting and restoring the fundamental things that make life on earth possible, pleasant, and healthy. Clean air and clean water are among these basic necessities for everyone alive on earth. In a world defined by connectivity, it’s hard to ignore news from elsewhere. Today 3 billion people live on less than two dollars a day. Just to get some perspective on this number, last year the U.S. population hit the 300 million mark. How do we process these facts? How do we make them real? How do we communicate such vital information in a connected world? We elect public officials who promise to spread democracy all over the world. Yet our own knowledge of democracy has eroded to sheer idiocy. How do we re-engage with democracy? How do we communicate democracy’s time-tested processes? How do we use this communication to connect us here and connect us to others elsewhere—the 300 million of us to the 3 billion of them? Graphic communication, art, and design have never been so important! Your skills can be applied to show the essence of an idea, to organize complex data. Simple and beautiful communications are needed at all scales, everywhere, in every language of the world. As artists you are learning to see what’s around you. Some may be comfortable with the tight focus or the local; some may want to take on the world. Whatever your focus, we need your skills of analysis, interpretation and, above all, your ability to evoke emotion—in order to help us write the story of humanity in a world of scarcity. Your role as visual communicators and provocateurs is key in our search for new ways of inhabiting the earth. Now that we can examine human settlement patterns, ice caps, forests, and all signs of habitation at the click of a mouse, our connections can be read in great graphic detail. Anyone with a computer can get Google Earth and the NASA website. And let us remember that once, in the 1960s, we had the political and societal vision to create the National Space Administration for the exploration of the universe, that in turn, brought us GPS, computers, photovoltaics, and a whole array of technologies which we now take for granted. The political and social will that it took to create the space program is once again needed, this time to create a new era of exploration of benign, non-toxic materials and new processes necessary for building a sustainable world. As artists and communication designers you can choose to be the outriders of society. Like the scouts in the old western films, you can be in the position of surveying the horizon and alerting the rest of us to the dangers and surprises ahead. But I worry about you. I worry that while you have evolved the use of your thumbs to work at phenomenal speeds, you are not as interested in developing the habits you need to accumulate knowledge, knowledge that can inform your vision as artists. I mean knowledge of the world—science, literature, and history—knowledge of the great contributions others are making or have made to our rich understanding of humanity and the earth which gives us life. It is not enough to find information instantly and use it opportunistically to support your argument. To be able to analyze and synthesize you need to delve deeply into a subject, build up your understanding incrementally, and own that knowledge. Own it, so you can call it up when you need it, without turning to your PDA, and use your amazing brain-power to interpret what you know when critical analysis is needed. What I’m asking of you is what I have always asked of myself: To be endlessly curious about everything, to search for facts when you need them, but more importantly, to search for ideas and meaning. Read a book, look at a building or a landscape, drink it all in—make it your own. This kind of broad-based knowledge will make you a valued collaborator. Yes, connectivity is also about collaborations. Today more than in recent memory teams of many different skills are forming around complex problems like designing buildings that breathe and make their own energy; designing gardens and large-scale landscapes that clean up brown-fields and filter rainwater and help replenish aquifers; designing communities near transit systems and with all necessary services, including schools, within walking distance; and always, always thinking of how human energy and clean, alternative energies can be used instead of fossil fuels. In the new world hungry for new ideas and proposals at many scales, the creative community must become a key contributor. So what do you bring to the decision-making table? As I see it you bring critical thinking, your ability to create beauty and poetry, and your skills in making things. Do not underestimate the power of the contribution you can make. Just look around in any city or any highway to see how aesthetically impoverished and inhumane some sites are. If you think that no human being should be asked to pass through a place, let alone live and work in it, you will immediately understand how necessary your chosen profession is. To be a valued contributor in these vital collaborations, every member of the team needs to be a good communicator. No arrogant, know-it-all language, please. Every participant needs to speak in clear and concise sentences, with passion and conviction: passion and conviction, not just for your art, but how it can contribute to make life better, more pleasant, and more beautiful for those living today and those who come after us. What a grand concept! 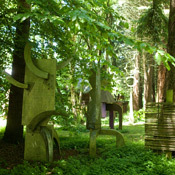 Designing and making art for today and for the future can be an inspiring and motivating occupation. The best news of all is that you are an environmentally-conscious and socially-concerned generation. You know intuitively as well as rationally that the 21st century is yours to shape. And what a great opportunity you have! To do meaningful and necessary work—that is the secret dream of every human being. And you get to do it. What a story you will write! So I challenge you to use your existing skills and expand them. I challenge you to use your famous ability to connect with others and share information about big, world-changing ideas. I challenge you to form creative collaborations that reach farther and deeper than we’ve seen before. With your technical proficiency and a growing understanding of nature and its processes you stand to give voice to a connected world. Just remember the breath we took together. And now, exhale, get your diplomas, and party—before you take on the 21st century. 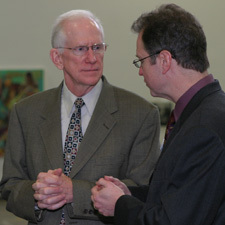 Szenasy, delivering the 2008 PNCA Commencement Address. Photo by Barrett Rudich, via Metropolis. Susan S. Szenasy is Editor-in-Chief of METROPOLIS, the award-winning New York City-based magazine of architecture and design. 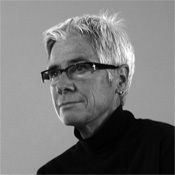 Since 1986 she has lead the magazine through decades of landmark design journalism, achieving domestic and international recognition. She is internationally recognized as an authority on sustainability and design. Ms. Szenasy sits on the boards of the Fashion Institute of Technology’s Interior Design department, the Center for Architecture Advisory, has served one term on the Landscape Architecture Foundation board and two terms on the Council for Interior Design Accreditation board. She has been honored with two IIDA Presidential Commendations, is an honorary member of the ASLA, and the 2008 recipient of the ASID Patron’s Prize and Presidential Commendation as well as the SARA/NY medallion of honor. She has received a citation and an honorary membership from NYC AIA. Along with METROPOLIS Publisher Horace Havemeyer III, Ms. Szenasy was a 2007 recipient of the Civitas August Heckscher Award for Community Service and Excellence. In 2011 she won the Gene Burd Urban Journalism Award and was named a Senior Fellow by the Design Futures Council. Ms. Szenasy holds an MA in Modern European History from Rutgers University, and honorary doctorates from Kendall College of Art and Design, the Art Center College of Design, and Pacific Northwest College of Art. She lives in New York’s East Village in a small loft designed by Harry Allen, where she moved after 9/11 to reduce her ecological footprint.